A visitor admired M.C. Escher's "Metamorphosis III" at The Hague's "Escher in the Palace" exhibit in 2003. Stairways that ascend and descend endlessly -- and yet go nowhere. People who morph into cities. Architectural impossibilities that challenge our understanding of what's visually possible. These are the hallmarks of Dutch graphic artist M.C. Escher, arguably one of the most recognized -- and marveled at -- artists in modern history. Although Escher is best known for his prints of mathematically and geometrically inspired structures and forms, such as "Ascending and Descending" and "Metamorphosis I and II," he also created many realistic landscape and architectural pieces in the early part of his career during his travels throughout Italy. Yet his most imaginative works, because of their almost supernatural ability to bend reality, have had the greatest influence on popular culture. 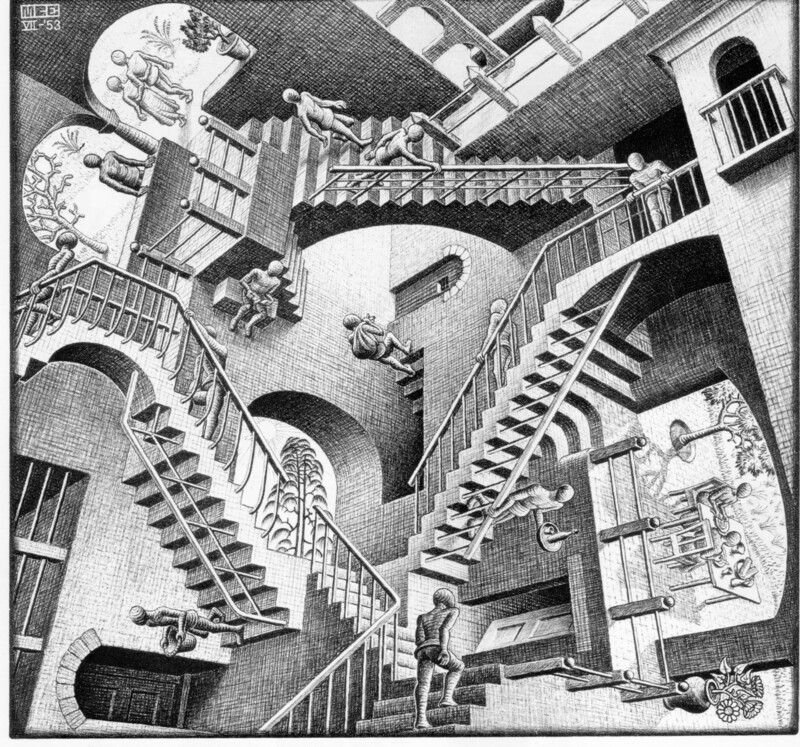 Movies, cartoons and music videos have repeatedly paid homage to Escher's works -- and one in particular, "Relativity," has gotten several tributes. One of the best-known re-creations of that work appears in the final scene of the 1986 movie, "Labyrinth" when David Bowie's character, Jareth the Goblin King, takes Sarah (Jennifer Connelly) to a series of twisted stairwells, which she helplessly ascends and descends. One self-proclaimed "professional nerd" even created his own version of "Relativity" out of Legos; you can take a peek at the original here. Although the public has long been fascinated with Escher's work -- his prints have adorned many a college dorm room -- the artist had a more difficult time gaining acceptance among his peers. Many other artists of his generation regarded him as too cerebral, as more of an intellectual than an artist. Scientists and mathematicians have found more in common with Escher than other artists. This makes sense, considering that Escher's works are firmly rooted in mathematics, particularly in principles of symmetry and geometry. Read on to the next section to learn more about the life and works of M.C. Escher.